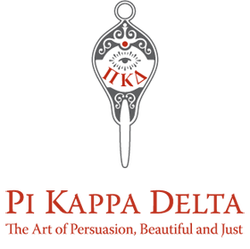 The name of this Forensic Honorary Organization shall be “Pi Kappa Delta”, the initial letters of the Greek phrase Peitho Kale Dikia, signifying “the art of persuasion, beautiful and just”. The name shall be written thus: PKD on all insignia of the fraternity. This chapter is established as the Ohio, Eta Chapter. The Greek insignia shall be as follows: ΠΚΔ. Pi Kappa Delta is a national honorary organization consisting of educators, students and alumni committed to encouraging the education of articulate citizens through a three part focus: the commitment to and promotion of ethical, humane and inclusive communication and educational practices; the commitment to and promotion of professional development of forensics educators; and the commitment to and promotion of comprehensive forensics programs. This chapter is considered to be an active chapter if the annual dues are paid each academic year and new members are enrolled. If this chapter does not meet the criteria for three consecutive years, it will be listed as an inactive chapter with the national organization. Inactive chapters may not participate in Pi Kappa Delta sponsored events. To become active again, the chapter must pay the current year’s dues, initiate new members, and pay a reactivation fee. Local Chapters consist of two kinds: Undergraduate and Alumni. This chapter is established as an “Undergraduate Chapter”. This Local Undergraduate Chapter is established in a recognized and regionally accredited college, which offers course work beyond the associate of arts degree. This chapter is sponsored through the College of Arts and Sciences, School of Media & Communication, Department of Communication at Bowling Green State University. This organization was chartered and recognized by Bowling Green State University and the National Office of Pi Kappa Delta on 23, May, 1930, making it one of the oldest student organizations at Bowling Green State University. Charters are activated by a written letter of support by the president of the university. This Local Chapter shall have full charge of all its activities within the limits of the Pi Kappa Delta National Constitution. A copy of this constitution shall be regularly submitted to the Bowling Green State University Office of Campus Activities along with the official student organization recognition and report paperwork. New membership will be enlisted by December 1 of each academic year. Membership is open to all Bowling Green State University students. New membership will be reported to the National Secretary-Treasurer by the Chapter Vice President. Failure to do so may subject the Local Chapter to probation or on an inactive status. If the Local Chapter membership falls below 5 active members for two consecutive years, it will be classified as an inactive chapter and therefore, have none of the rights specified of the active chapters specified in the National Constitution. The chapter may be returned to active status by bringing the membership up to the constitutional requirements and by paying current chapter dues. Procedures are subject to the National Council. In the event of falling under membership standard, the faculty sponsor may wave the membership application and induction to appoint members as long as reasonable expectations or circumstances prevail. The Local Chapter has one vote in the affairs of the Providence Organization and the National Organization. This vote may be delegated to a representative in case of conventions and shall be a majority vote of a chapter’s active members in case of referendum. In the event of non-participation by members, the faculty sponsor shall hold the responsibility of casting official votes on behalf of the chapter. The National Council sets the mandatory initiation fee for members of all divisions of membership, payable upon application, with majority approval by the National Convention. At the time of thes constitutional revision, the national membership fee is $50 for a lifetime membership. This chapter has established an annual membership fee of $10, payable to the chapter Treasurer during the fall academic term. Membership fees are deposited within the chapter’s budget account for use as deemed appropriate by a vote of the membership. The Local Chapter will elect officers at least once each year during the spring term. The following offices must be filled: President, Vice President, Secretary, Historian/Engagement Officer and Treasurer. A non-elected position of Travel Coordinator must be filled by appointment and elected officers may fill the duties of this position. In the event of insufficient candidates, the chapter may vote to merge the office of Secretary with that of Treasurer until suitable candidates are available. The Local Chapter will follow Robert’s Rules of Order in the election process. All officers must be active members either engaged in competitive forensics or communication service events during the terms of service. A cumulative 2.5 grade point average must be upheld by all officers in compliance with Office of Campus Activities policy. An officer can be removed from office should they fall below active status, fail to attend meetings, fail to support the organization or be deemed unworthy by a 2/3 vote of the active membership. It is the President's responsibility to coordinate chapter elections, including the creation of a written or electronic ballot. In the event that the chapter President is unavailable or is running for office him/herself, this duty, refers to the faculty sponsor. It is the faculty sponsor's responsibility to tally all ballots and announce the results of the election. Coordinates officer elections, creates official written or electronic ballot. o Event postings on the Campus Calendar and Zoom News. Creates an end of the year Media Presentation (slideshow, movie, video, etc…) to show progress of the organization. This must be appropriate for the greater viewing community and posted to YouTube. Maintain lines of communication with alumni and greater community through Twitter, Radio, Television, Web Development, Facebook, Newsletters and other forms of media outreach. This includes development and maintenance of team social media. In the summer prior to the active season, the faculty sponsor shall provide login and password administrative access to chapter and Falcon Forensics and debate Team social media sites. Posts, videos and photos should be tasteful, respectful and in the best motivational interests of the organization. It is the responsibility of this position to build social media audience and change platforms and approaches as new social media platforms and technology emerge. This Local Chapter shall have a faculty sponsor who shall be recognized by the college and the Pi Kappa Delta national office. If at any time, the chapter does not have a sponsor, it shall be grounds for possible action resulting in the chapter being placed on probation or having its charter revoked. It shall be the responsibility of the faculty sponsor to serve as a sounding board and resource for all organizational decisions. The faculty sponsor must be a member of Pi Kappa Delta in good standing and has all the rights, privileges and expectations of said membership. At the chapter level, the sponsor has one vote on all chapter issues, but also has the power to “table” or “veto” any decision in order to maintain alignment with university expectations, values or standards. The faculty sponsor has the right to suspend the constitution in order to make decisions in the best interest of the chapter, should reasonable administrative decisions be ineffective or immediate action warranted. The faculty sponsor of the Chapter shall be the responsible head of the undergraduate organization as far as its relation with the National Organization is concerned and he or she shall be responsible for the fulfillment of the requirements of the constitution and the regulation of the National Organization. The Local Chapter shall meet a minimum of once per month or as deemed appropriate in order to meet organizational needs. The meeting schedule will be established the spring term prior to the active academic year and will note all regular meetings for the full academic year. Additional "special" meetings may be called by the PKD officers as long as sufficient notice is given to all active members so they may attend. "Officer Only" meetings are permitted. Membership in Local Chapter will be open to individuals in good academic standing at Bowling Green State University and who participate and show proficiency in competitive or non-competitive communication events and/or service projects. Individual chapters under the National Charter may define the appropriate level of participation and grade point for initial membership. This chapter defines participation according to the National Charter and requires a cumulative 2.5 grade point average on a 4.0 scale for membership (the same average established by BGSU establishing good academic standing). Eligible students must have participated in a minimum of 3 forensics tournaments and/or Communication Service Projects. They must be selected by the active membership. Criteria used for this selection may include: Dedication, Reliability, Involvement, Academic Standards, Service and Understanding/Commitment to Pi Kappa Delta Values. Eligibility must be verified by the faculty sponsor. Upon determination of eligibility, the Chapter Vice-President shall send a formal written invitation to each potential member. Each candidate for membership in this honorary shall make note in writing/email to the Vice President of Pi Kappa Delta noting their desire to join. The Chapter shall then make an investigation of the eligibility of the candidate, and after two-thirds affirmative vote of the active members, shall recommend the applicant for membership. The applicant shall complete an online application form to the National Office together with the initiation fee as provided by the National Council as noted in 302.4. The National Secretary-Treasurer shall issue the membership card and pin. After completing the Chapter induction ritual, the applicant shall be given the standing for which he or she is eligible as a regular member with all privileges. A membership certificate will be issued upon request at cost. The qualified members for induction will be notified at the minimum of two weeks before the induction. All those involved in the ceremony will be required to wear tournament dress. The inductees will be required to go through no pledging, however, they will be required to memorize the Greek Alphabet, in order to help foster an understanding of the importance of an honorary fraternity. They will be expected to present a portion of a forensics event or defense of a service project and will be subject to reasonable questions from a panel of active members. This chapter will follow the induction ceremony that can be found in the National Pi Kappa Delta Ritual Guidelines. The ceremony that will be followed can be found in the Bi-laws. The organization fully supports and adheres to BGSU and national anti-hazing policies. The Local Chapter shall have the power to levy such assessments on its active members as it may choose. Nonpayment of assessment shall render the delinquent liable to transfer to inactive membership by a three-fourths affirmative vote of the active members of the chapter. Due notice must be given to the National Secretary-Treasurer as deemed appropriate. Members are required to support the organization and to attend regularly scheduled meetings. Members are considered “active” as long as the criterion for eligibility is met. In addition, active members are expected to attend monthly meetings, support Pi Kappa Delta events, fundraisers, conventions and programs. Failure to attend required meetings may result in suspension from active status based on a 2/3 vote of the membership. Inactive members may participate in meetings, but forfeit their voting rights and the right to hold office until reactivated. An inactive member (non-competing or communication service) may regain active status upon payment of all past dues and assessments that were unpaid during the period of inactive status. Then with the payment of the designated national reinstatement fee and completion of the reinstatement ceremony, the inactive member can regain active status with a two-thirds affirmative vote of the Local Chapter's active members is required. A two-thirds affirmative vote of the Local Chapter’s active members is required. Notice of the reinstatement shall be sent to the National Secretary-Treasurer. Members are to respect other members within this chapter, other forensic teams, chapters, and the National Constitution. Members will have respect for all materials used. Members are encouraged and expected to conduct themselves in conformance with the highest of standards in regard to academic honesty. Included in this policy are infractions such as cheating, plagiarism, collusion, and fabrication/falsification of records. Pi Kappa Delta members are subject to the Bowling Green State University Academic Integrity Policy as documented in the faculty and student handbooks. This Local Chapter will follow and be supportive of the Bowling Green State University Substance Abuse Policies of alcohol and illegal drugs. If necessary, this chapter will support any recriminations if a member of the chapter breaks these policies. By two-thirds vote the organizational body may enact additional disciplinary action. The faculty sponsor will take additional actions if necessary. Membership of this fraternity shall be considered and promoted as lifetime at the national level. It shall be of three classes, three orders, and three degrees. The classes shall be: Active, Inactive, and Honorary. Only college students, and faculty members actively engaged in the instruction of one or more of the activities coming under the Order of Undergraduate or the Order of Communication, or a coach of one or more forensic activities shall be eligible for admission as Active members or an Undergraduate Chapter. All those who have been Active members of an Undergraduate Chapter, but have transferred, graduated, retires or for some other legitimate reason have disassociated themselves with the chapter shall be eligible for Active membership in an Alumni Chapter provided they support its ideals and work. The inactive class of this fraternity shall be composed of those Active members who are no longer attending the institution in which their Undergraduate Chapter is located, or who have been placed in the inactive class by action of the Undergraduate Chapter as provided in Paragraph 403, or, in the case of those who, though eligible for Alumni Chapter membership, are not interested in maintaining their Active status. Persons who have interest in forensic activities and who have been nominated and elected by an Undergraduate chapter and approved by the National Council will be admitted as honorary members. All students and instructors who transfer from recognized institutions may receive full credit for their previous forensic work toward eligibility for membership or advancement in orders and degrees. Members of other forensic organizations may become members of Pi Kappa Delta and members of Pi Kappa Delta are free to join other forensic organizations. The orders shall be: Undergraduate, Instruction, and Active Alumni. Membership in the Order of Undergraduate will be for students participating in competitive speech and debate in recognized college competition. The Order of Instruction is open to all communication educators and follow the same degree structure as listed in 505. An instructor is eligible to obtain degrees as stated in the National Constitution when they have had 5 students, or more obtain a degree level. Membership in the Order of Active Alumni will be for alumni continuing to contribute to the betterment of their program and the forensic activity. Furthermore, one must have been an active member of an undergraduate chapter. The degrees shall be: Proficiency, Special Distinction, and Highest Distinction. The degree of proficiency is for the individual members. This constitutes the initial degree of membership. The degree of special distinction is for those members who have at least a 3.0 gpa, participated in communication events for at least two academic years and have demonstrated excellence in communication skills in either competitive and community service or achieved a superior rating at the national tournament. The degree of highest distinction is for those members who have at least a 3.5 gpa, participated in communication events for at least two academic years and have demonstrated a superior command of communication skills in either competitive or community service projects. The official badge of Pi Kappa Delta shall be a gold key and shall make use of the symbols of the triangle and gavel as well as parameters established by the National Council. The key shall denote degree, class and distinction through a series of gems set in the eye of the key. The National Council Ritual Guidelines establish the gems and use of this symbol. The Pi Kappa Delta gold key shall not be used as any form of jewelry. Misuse of the badge is disrespect to the Honorary Fraternity. Doing so shall be grounds for expulsion from membership. Pi Kappa Delta members of an active status at the time of graduation will receive silver and red honors chords recognizing their involvement in the national honorary. The latest edition of the Robert’s Rules of Order shall be the authority in parliamentary procedure not covered by specific provisions of this or the National Constitution. Two-thirds of the Pi Kappa Delta members must be present, to constitute a quorum and hold a vote on any issue except the case of amendments. In case of a tie, the faculty sponsor will serve as the deciding vote. The sponsor does have the right to revoke any vote made by this Local Chapter in the case of its breaking Bowling Green State University policies and/or the National Pi Kappa Delta Chapter policies. If the Local Chapter does not agree to the revoking of a decision by the sponsor of the fraternity, this chapter by a unanimous vote may override the sponsor’s decision. This Local Chapter will vote on amendments following the procedures of Robert’s Rules of Order. Active members of the chapter may enact amendments to this constitution with an affirmative vote of two-thirds. In case of a tie, the sponsor and/or the Director of Forensics will be able to break the tie. If the sponsor does not approve the amendment, the sponsor has the power to table the amendment until further discussion may occur. Pi Kappa Delta is organized exclusively for educational purposes including such purposes as making of distribution to organizations that qualify as exempt organizations under section 501 (c) (3) of the Internal Revenue Code, or corresponding section of any future federal tax code. The Ohio Eta Chapter qualifies under these purposes and is also under the Bowling Green State University exempt policy. No part of the net earnings of Pi Kappa Delta shall inhere to benefit or be distributed to its members, officers, or other private persons. Pi Kappa Delta shall be authorized and empowered to pay reasonable compensation for services rendered and to make payments and distributions in the furtherance of the purposes of the Local Chapter. No substantial part of the activities of the chapter shall be the carrying on of propaganda or otherwise attempting to influence legislation and Pi Kappa Delta shall not participate in or intervene in any political campaign on behalf of any candidate for public office. Notwithstanding any other provisions of these sections, Pi Kappa Delta shall not carry on any other activities not permitted to be carried on by an association exempt from federal income tax under section 501-(c) (3) of the International Revenue Code, or any future federal tax code. We ascribe this constitution on this the 24rd day of the month of July in the year 2016. This constitution hereby replaces all previous constitutions. This document serves as the governing philosophy for this organization in both letter and spirit. By the following signatures we hereby establish and endorse this constitutional document. Signed copy in official organizational archives.